I have introduced several days ago a magnificent scarf that illustrated the Maison's legendary establishment at 24, rue du Faubourg St.-Honore, as perceived through a kaleidoscope. Today's post features an equally enchanting view captured on canvas, as perceived through a telescope. The instrument, believed to have been invented by Hans Lippershey in the Netherlands in 1608, has been improved the following year manyfold by Galileo Galilei (considered the father of modern science thanks to his remarkable research, discoveries and inventions in the fields of Physics, Mathematics, Astronomy and Philosophy). It is thanks to the telescope (or spyglass) that objects far into the distance can be seen at arm's length ("Science has eliminated distance" as Gabriel Garcia Marquez famously wrote in "100 years of solitude"... and the character Melquiades wittily proclaims: "In a short time, man will be able to see what is happening in any place in the world without leaving his own house"). Issued in 2006, "Regarde Paris" ("Watch Paris") is an invitation to discover the City of Lights. The scarf zooms in on the soul of the city - l'ile de la Cite - the name of the larger island on the Seine where the first documented settlements occurred. While the image is lovely, one can discover, upon closer inspection, that the illustration is created by thin lines suggestive of a pencil drawing, which, on its own, would render those particular details perhaps too abstract when the scarf is worn or even folded. The white inner corners however bring a visual balance to the scarf when knotted, and this particular colour combination of orange, white and black, is a lovely "piece de resistance" in anyone's collection. 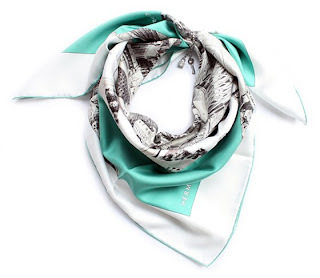 The interesting aspect of this scarf is that its title is as much symbolic as it is real. The "Musee Vivant du Cheval" ("Living Museum of the Horse") is dedicated to the establishment in Chantilly, France (housed in the Great Stables of the Chateau de Chantilly) committed to the equine art and culture. With a long history to build on (the stables were erected in 1719 by Louis-Henri, duke de Bourbon, who believed that he would be reincarnated as a horse and hence commissioned the architect Jean Aubert to build the stables so as to reflect the majesty of his rank), the Living Horse Museum draws countless crowds from all over the world, who undertake the trip, some 40 km North of Paris, to admire the horses, of some 30 different breeds, following daily routines. In addition to various exercises, the horses take part in "educational" demonstrations, where riders, dressed in the museum's period costumes, lead the horses to perform "airs" for visitors. The scarf captures such "airs" performed by the horses, while the middle reveals an additional illustration of the actual museum building. In his traditional and renowned style, Hubert de Watrigant (the painter who created this design and whose select creations are exposed inside the museum) has depicted the horses with accuracy and with a great sensibility for the detail. A pleasure to wear, the scarf shows beautifully around someone's shoulders or neck. This design is the fruit of the talent and effort of an unsuspected artist, Kermit Oliver, a native of a small Southern Texas town called Refugio. A mail sorter by day and a prolific artist during his leisure time (he is said to paint at his kitchen table), Oliver was the first American artist to design for the Maison. He describes himself as reclusive, almost ascetic, an individual who communicates and expresses himself through art (he is equally notorious for spending hours on end outside galleries where his art was exhibited, not being able to decide whether to step inside or not). 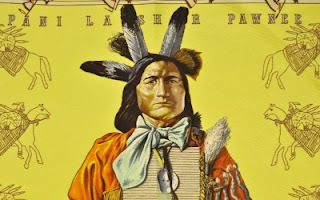 This design depicts a Pawnee Indian chief. Of particular interest is the character's face, which is not only complex to realize graphically, but also very expressive. As a point of reference, a regular scarf may be subjected to 25 separate colour applications to render a particular design; this scarf required 36 screens, of which 11 alone to convey the skin tones in the face. As a result, this design famously remains one of the most complex ever produced by Hermes. Released in 1982, this scarf has been reissued numerous time thanks to the wild popularity of this design. It ties wonderfully, thanks to the Native American motifs playfully arranged along the edges and illustrated on top of apparent geometric lines, and due to the many releases in numerous colour combinations, this design is sure to appeal to almost anyone with a discerning taste. I must confess, I had disregarded this design at first, likely because of the colour combination of the scarf that I first came across, yet as I discovered other colours, I realized that there was a certain passion and harmony intrinsic in this design. "Feux du ciel" ("Sky Fires") depicts fireworks - or even comets whose incandescent tails leave trails of fire behind them - against a starry night. The viewer appears to be drawn into the unknown with a great deal of anticipation for the object - or person - that is about to appear, born from the "fire" that several such objects, taking center stage, create. So after a second review, I recognized the intensity of the image and the passion it triggers. This pattern was first issued in 2000/2001 - in both silk and cashmere/silk combination, and again in 2003/2004. While I haven't seen this scarf knotted, I anticipate it renders the scarf stunning - particularly when the contrasting colours are revealed (or hidden) in a knot. I have searched for a design that was symbolic of a new beginning, a new direction, a new outlook on life, renewed hope and optimism - to represent the beginning of a new year (and of a new decade). Something dramatically different - and my mind set on a scarf Hermes has created in a limited series of 200 pieces each last year available exclusively through its Paris boutique at 24, rue du Faubourg St.-Honore. 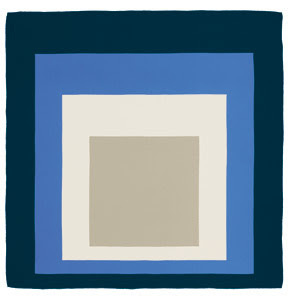 "Master" and Bauhaus teacher, initiator of the Op Art movement (op art, short for optical art, is a genre of visual art that explores optical illusions), Josef Albers (March 19, 1888 - March 25, 1976) was a German-born American artist whose work, both in Europe and in the US, formed the basis of some of the most influential and far-reaching art education programs in the 20th century. 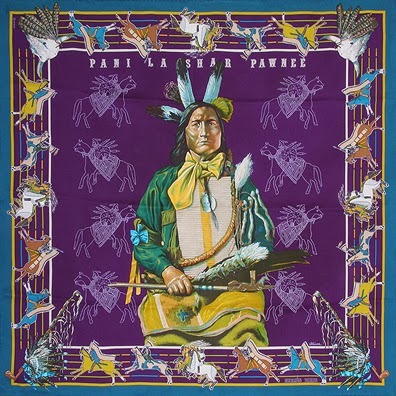 Starting in the 1950s, the artist created a series of paintings entitled "Hommage au carre" ("tribute to the square") that served as the inspiration for these scarves. Hermes has kept true to the originals. 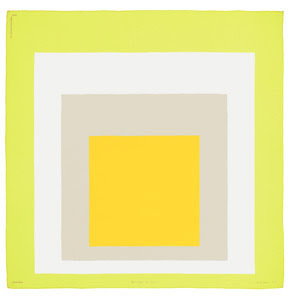 Veritable paintings on silk retracing the artist's research on the interactions of colours, these scarves pay tribute to Albers' contribution to the world of art as well as to his continuous explorations of the power of colours. The upper picture is entitled "Joy" whereas the one below is called "Greek Island". These scarves have retailed for € 2,000 apiece.